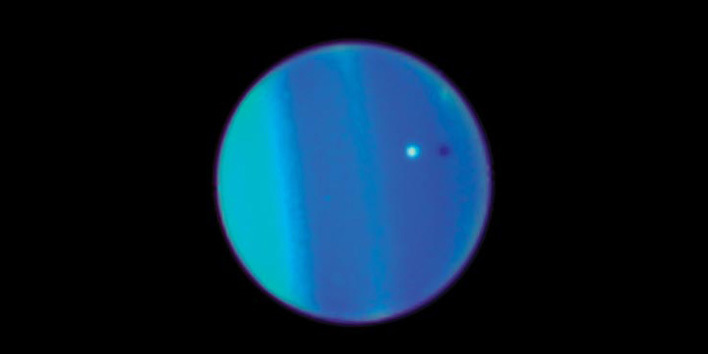 This infrared image of the planet Uranus was captured by the European Southern Observatory’s Very Large Telescope during the planet’s 2008 equinox. Every 42 years, the ring (and satellites) plane of Uranus line up with the Sun causing them to appear on edge from Earth’s point of view. A one minute exposure time was used, the maximum allowable to prevent the moving satellites from appearing as streaks. 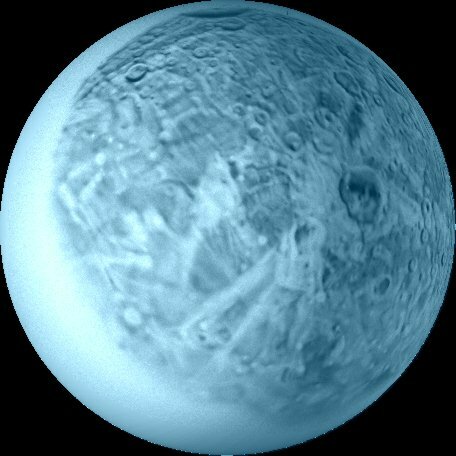 The IR filter used matches the absorption bands of the methane in the atmosphere of Uranus, making the relatively bright planet (almost) completely disappear. That permits the otherwise invisible rings and small satellites of Uranus to be detected instead of being lost in the glare of the planet. The bright spots on each side of Uranus are Miranda (~470 km diameter) and Ariel (~1100 km diameter). Two much smaller satellites can be seen just above the ring plane,to the left of the planet. Puck (~150 km diameter) is closer to the Planet than Portia (~100 km diameter). Saturn’s rings are so prominent that they easily visible from Earth with a small telescope. All the other gas giant planets have ring as well, but they weren’t discovered until we were able to look at those planets from above the Earth’s atmosphere. Here are some pictures of the ring system around Uranus taken by the Hubble Space Telescope as our point of view shifted over several years. The next time the rings will be edge-on will be in 2049. Titania’s tortured terrain is a mix of valleys and craters. 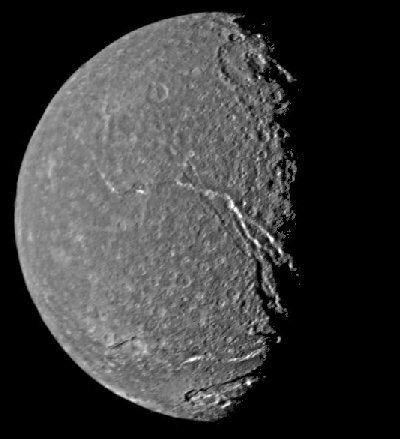 Voyager 2 passed this moon of Uranus in 1986 and took this photograph. The long valleys indicate that Titania underwent some unknown tumultuous resurfacing event in its distant past. Titania is essentially a large dirty iceball composed of a roughly 50/50 mix of water ice and rock. It was discovered by William Hershel in 1787.